Add the MVP Michelada, a spicy beer-based cocktail and a new Millennial favorite, to your brunch cocktail menu with this simple recipe. Fresh lime --- 1 ea. Coarse kosher salt --- 1 tsp. Soy sauce --- 1/2 tsp. Draft beer --- 12 oz. Cut lime in half and rub half around the rim of a 16-oz. beer mug to moisten; dip rim lightly in salt. Fill mug half-full with ice. 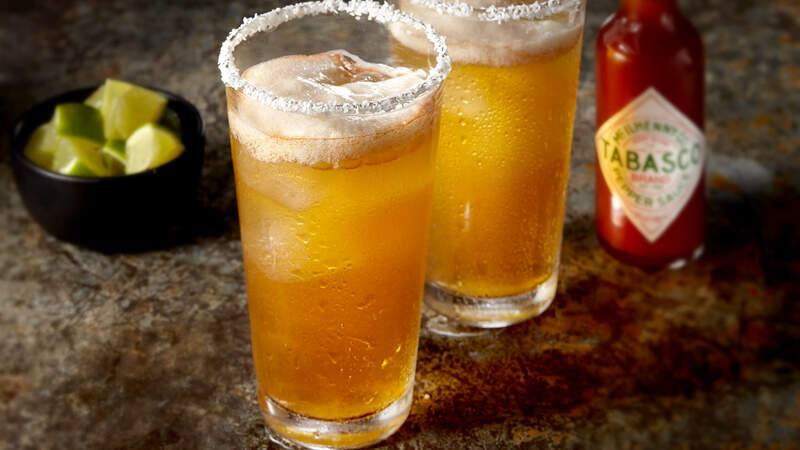 Squeeze juice from remaining half of lime and add to mug along with soy sauce, Worcestershire sauce and TABASCO® Sauce. Fill mug with beer and stir just enough to combine well. Cost Per Serving* $2.59 Total Profit $--.-- *Based on FDA average pricing for ingredients.